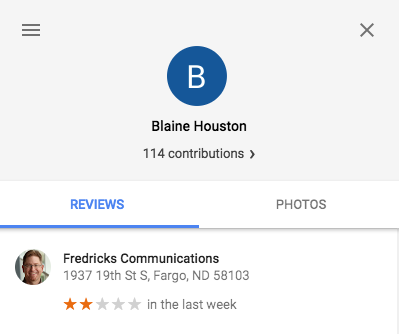 Fredricks Communications received a fake Google rating last week from someone named Blaine Houston. Mr. Houston gave FredComm two stars out of five with no accompanying comment. Only problem is, I’ve never met, let alone provided advertising, marketing or PR services to, anyone named Blaine Houston. Before I get to my response to Mr. Houston, let me just say this is frustrating stuff. You work your backside off, try to provide the best possible customer service, eat, sleep and breathe quality work, and something like this happens. Well, as the old saying goes, it happens. Sadly, that is a fact of business these days. If it happens to you, here’s an informative blog post about how to get rid of one – How to Remove Fake Google Reviews. Thank you for taking the time to let Fredricks Communications know you are less than happy with… something… at some business… in Fargo, N.D. Since we’ve never met, and Fredricks Communications has never served or done business with you, I’m left to assume something went wrong when you were attempting to rate another business – a slip of the thumb, perhaps? – and your two-star review mistakenly was connected with my business, instead. I notice you’ve left less-than-positive reviews for 47 businesses in the Fargo, N.D. area. Perhaps the review you gave my company was meant for one of those? Regardless, I share your frustration with having a poor experience with a business. I can only imagine how frustrating it must be to mistakenly give a different company a poor rating that could impact it negatively and make it look bad in the eyes of its customers and prospective customers. And, finally, I now know firsthand, and all too well, how frustrating it is to get a poor rating that my business did not deserve or earn. If we ever meet, I’ll be happy to tell you about my company and offer you a wide range of services related to communication, messaging strategy, advertising, marketing and public relations. Again, thank you for your time. Fredricks Communications wishes you all the best. Make sure you always respond to Google ratings or reviews, or reviews of your business on any other platform, whether they’re fake or genuine, good, bad or indifferent. If it’s a bad review, your response needs to include what you’re going to do to make the bad experience better, if possible, or to make sure it never happens again. Maybe offer the reviewer some sort of incentive to return. Bottom line, always show people you care and you’re paying attention, whether you’re business is an advertising agency, a steakhouse or a cleaning service.